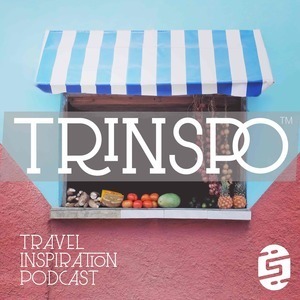 25 episodes of Trinspo: Travel Inspiration since the first episode, which aired on April 2nd, 2018. Meghan & Sean take us on their spontaneous honeymoon-esque journey across Europe, discussing high-class dogs, creepy mannequin hallways, and imitation croissants. Happy Cray May! Guest Sarah Murray discusses learning travel tips the hard way, gets real about food traveling, and discovers a deep truth while far from home. Have you ever avoided baggage fees by wearing your luggage? Spring tells a hilarious story about a discount airline mishap, discusses the empowerment of being a solo female traveler, and gives insider knowledge of going backwards through security checkpoints. Steven reveals the best pro tip for choosing your next vacation locale and talks about the uniqueness and beauty of Croatia. Steven and Heather discuss modern clubs' strategies to keep you on your best behavior, artifacts of broken relationships, and why we strive to visit places others haven't. Maria imparts stories from her career driving a truck for a living. Heather and Maria discuss the struggles of haggling, driving the wrong way on one-way roads, and people's worst behavior while driving. Xiao finishes the story of his first European journey, telling us about his two-day road trip to the Isle of Skye, the dress code for London football games, and crazy travel foods. Guest Xiao Guo tells us all about his first Euro trip. In this episode, Xiao heads out for solo travel in the City of Lights, drinks a lot of Scottish whiskey, and castle mania. Samantha and Heather discuss the parallels of life and travel. Samantha's trip to Copenhagen, love of cardamom, and time with hipster Danish sailors. The flight that changed origin country, and the sounds of a city.